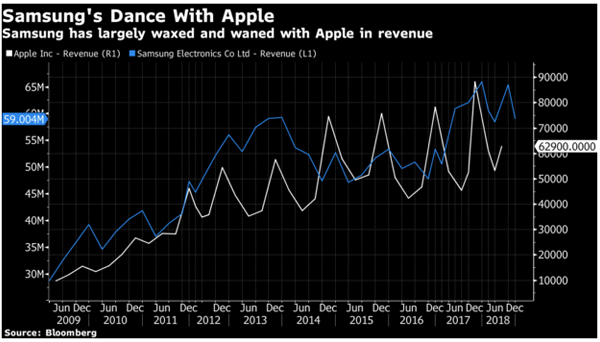 Hot on the heels of Apple announcing that it was not going to reach previously estimated revenue numbers, competitor Samsung has also announced that its quarterly profit and revenue numbers are short of those that were previously expected. The company saw lower than expected demand for memory chips during the final three months of 2018, the same period of time that caused Apple its own problems. Samsung says that its operating income fell to $9.6 billion in the final quarter of 2018, short of its $12.3 billion average of estimates that had been provided by analysts to Bloomberg. Samsung also believes that the same factors that caused Apple’s lowdown also impacted its own numbers, including the current relations between the United States and China, the company’s two biggest markets. Demand for anything that uses memory chips was down, putting a strain on Samsung. Apple’s own slow sales also took a toll on Samsung. Song Myung-sup, an analyst at Hi Investment & Securities Co. says that the problems are definitely not just with Apple, as was seemingly believed to be the case by many in the press recently. Samsung isn’t expecting things to look up any time soon, either, saying that slow memory sales are likely to cause similarly poor numbers for the first three months of 2019.